History comes alive on this East Coast tour featuring some of the East Coast’s most thrilling cities: Boston, New York City, Philadelphia and Washington D.C.On this East Coast tour, enjoy sightseeing in each city. With an expert Local Guide—someone who knows the ins and outs of the city—see some of Boston’s historic sites including Boston Commons, the Old State House, Faneuil Hall, and the Freedom Trail. In New York City, see Times Square, Greenwich Village, Chinatown, and more. In Philadelphia, visit the Liberty Bell, a symbol of liberty, and Independence Hall, the birthplace of America where the Declaration of Independence and U.S. Constitution were debated and signed. In Washington DC’s famous landmarks, including the graves of John and Robert Kennedy at Arlington National Cemetery, the Lincoln Memorial, and Washington Monument. Stop for photos at Capitol Hill and the White House. This vacation designed for value-minded travelers also features a harbor cruise in Boston. See Bunker Hill Monument—site of the June 17, 1775, battle—and the Boston Tea Party boat. You’ll also have free time on your own to explore. Perhaps join an optional dinner in one of Washington DC’s favorite restaurants, followed by an illumination tour of the monuments. In Boston, explore the cobblestone streets and savor a meal at one of the many world-class restaurants. Perhaps enjoy a Broadway show in New York City, shop on famous Fifth Avenue, or visit historic Ellis Island. Guided sightseeing combined with free time to explore on your own makes this the perfect tour to experience the East Coast’s thrilling cities. 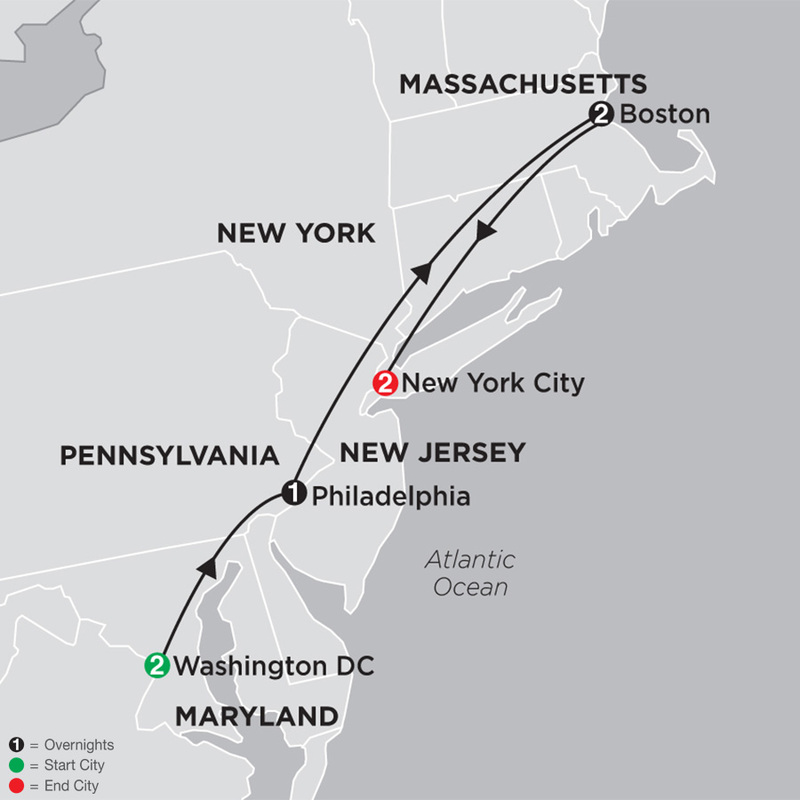 Day 3: BOSTON–NEW YORK CITY. Day 4: NEW YORK CITY. Day 5: NEW YORK CITY–PHILADELPHIA. Sightseeing with Local Guide; visit Arlington National CemeteryBoston Harbor cruise; private, deluxe air-conditioned motorcoach while touring with free Wi-Fi. Question: How do you get from one city to another? Do you fly or go by bus? Transportation between cities will be by motor coach. Question: Can someone sign up for a roommate if no traveling companion is available. Yes- If you request at time of booking with us, Cosmos will automatically room share you with another solo passenger of the same gender, allowing you to split the cost of hotel rooms.